Crown molding or crown molding with decorative accents such as rope or a basket weave pattern can complete the look of your kitchen or bath cabinets for a furniture look or more finished look. Carved crown moldings with custom designs are available in some higher end cabinet lines. These molding can also be purchased to extend around the perimeter of the room to match the top of the cabinets, if desired. Matching moldings can also be used to create matching vanity mirrors. Below wall cabinet treatments sometimes called light rail can be installed at the base of the top cabinet for a more finished look or to hide under cabinet lighting. Corbels add elegance and sophistication to cabinet corners. Most commonly, corbels are found on islands. They are particularly helpful when a countertop that is thicker than a standard countertop is used. The corbels can appear as though they are supporting the weight of the thicker countertop or some can actually be used as support for the weight of the countertop. Turned posts can be used in full to create table legs or they can be halved and applied to areas like island corners for added decoration and dimension. Similar to turned posts, pilasters can be applied for a more elegant and sophisticated look. Pilasters by definition are slightly projecting columns built into or onto a wall or cabinet. Decorative feet are designed to make cabinets look like furniture pieces or to give a different dimension to a special area. For example, if the sink cabinets are pulled out past the line of the rest of the cabinets for a more dramatic look, the front of those specific cabinets can have decorative feet. Decorative feet can also be found on the island or cabinets designed to serve as a china hutch to create a furniture look. 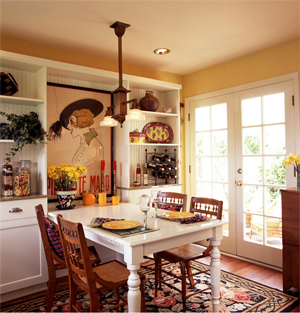 Overlays can be added to areas like the kitchen hood to give a more decorative focal point. Wainscot panels can be used to accent the cabinetry by being installed on the perimeter walls of the room either below the chair rail or fully covering the walls.